This Christmas, most families in the UK will buy a Christmas tree and send cards to friends. However, these Christmas traditions only date back to the 1840s, and are actually German in origin. 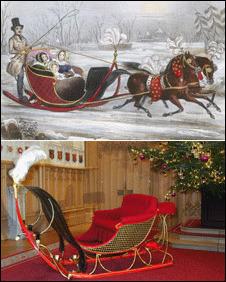 In the 1840s and 1850s Queen Victoria and Prince Albert popularised a new way of celebrating Christmas. An engraving of the Royal Family celebrating Christmas at Windsor was published in 1848 and their German traditions were adopted worldwide. Kathryn Jones, is assistant curator of decorative arts at the Royal Collection, which is currently hosting a Christmas exhibition at Windsor Castle. She said that Prince Albert was instrumental in bringing German traditions to Britain, such as the Christmas tree. "It has become the accepted way we celebrate Christmas now," she said. "Queen Victoria's mother was German as well, so the Royal Family did have trees before Prince Albert popularised the Christmas tree. "Queen Charlotte, George III's wife used to bring yew trees in at Christmas. "But for most people in Britain the idea of having a tree inside was completely new. "People would bring in a branch of a tree or holly or mistletoe, but there wasn't that traditional Christmas scene that we know now." 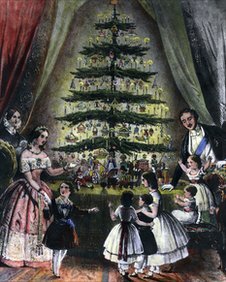 A drawing of the Royal Family celebrating around a decorated Christmas tree in Windsor was published in 1848 by the Illustrated London News. Prince Albert also sent decorated Christmas trees to schools in Windsor and to local army barracks. "Queen Victoria and Prince Albert brought the tree into Windsor Castle on Christmas Eve and they would decorate it themselves," said Ms Jones. "They would light the candles and put gingerbread on the tree and the children would be brought in." This year's predicted white Christmas would have seemed very familiar to Queen Victoria and her family. "There were very cold winters in the 1840s and 1850s, there was a lake at Frogmore House which used to freeze, and Albert and the children used to skate there. "Albert was a really good skater, and Queen Victoria tried to learn, but she never really got very good," said Ms Jones. "They had a sleigh they used to ride around in, one year they even rode it to Slough." The Victorian Royal Family may have started the craze for trees and cards at Christmas, but they were not so keen on turkey. "They always had roast beef. They did serve turkey, but not necessarily every year," said Ms Jones. "In the 40s and 50s they had a lot of different courses on the table. "We've seen the menus and there were huge lists of meals. "They would have different courses, maybe up to 20 different dishes. Quite often they would have a boar's head in the middle of the table. "They sometimes had exotic birds such as snipe or capercaillie. "They had swan on one menu." An display based on the theme of Queen Victoria's Christmas is currently on show at Windsor Castle. There are special displays and activities from 10 December until 5 January.